Perhaps the true measure of a strong man is how he is under pressure when growing a beard. And, no, you can’t call those wispy pre-teen hairs around your lips and chin one. Let’s be honest, growing a beard is as nerve-wracking as they come. You expect it to be trouble-free, thinking you don’t need to do anything else but wait for your facial hair to grow. You imagine a lustrous wedge to frame the bottom of your face, but what you get is a patchy, feeble smattering that reminds you of the aftermath of a forest fire. But if you’ve decided that a beard is what’s going to define you as a man, then we’re here to help. But you have to know from the start that it’s a true rite of passage because you’re going to have to endure taunts and sniggers, the shrieking of young relatives, and discovering a new way of eating soup. If you think you can handle that, then let’s start getting you that impressive beard you want so bad. If you’re a beard virgin, don’t tell anyone that you plan on growing one. Just stop shaving and let it grow. For those blessed with being hairy, it’ll only take a few weeks before you can start shaping it. But if you’re the less-furry type, we recommend a full month, or even more, depending on how long and thick it already is by then. Only you can judge that. The first week is easy—you’re barely even going to notice it. On the second week, some hairs might grow more than others and curl back and irritate the skin. And every week it just gets tougher. You’re going to need to keep those areas clean and exfoliated. Let’s say you’re happy with the length of your beard now, and it may have a shaggy look. Now, you’re going to get to trimming. It may feel right, but you have to go against your instincts and let your beard grow down your neck a little. Then, that’s when you start shaping your beard. We recommend that you let a barber oversee your first trimming session. Depending on the kind of barber you have, he’ll most likely shape the bottom of your beard following the curve of your jawline. It’ll look a bit square on the edges at first, but it’ll give those little hairs something to grow into. After that, all you have to do is keep it in check. Where you trim is very important, so you have to keep three areas in mind: the cheeks, the upper lips, and your neck. So look head-on in the mirror and, with clippers, follow a horizontal line that levels with the point of your chin. You can then run it a little on your cheeks. With a pair of scissors, trim a little bit of hair above your upper lip because you don’t want to look like a complete Sasquatch, do you? All there is left to do is be prepared to pick crumbs out of that beard when the time comes. 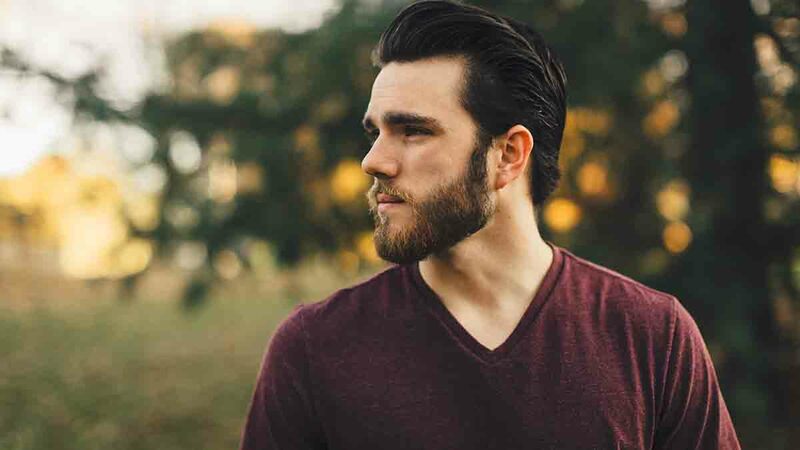 Just like the hair on top of your head (if you have any), you need to groom that beard with some hair products. Of course, when taking a bath, mild shampoo and conditioner will do. Handle it with care like it’s a furry puppy you bought with your savings. At times, especially after swimming or being outside for a long while, your beard will feel a little like a scrubbing brush. This is when the seemingly unnecessary grooming products will laugh at your troubles because, now, you need them. It may come as a surprise to you, but a beard moisturizer is an actual product and a rather wise buy. For the super-short, three-day-old beards, there are light products. Of course, for the thick and lavish beards, there are stronger ones. Trust us, oils are worthy investments. There are also products like beard balms that are much thicker than oils that will help your beard become softer than a Chow Chow’s fur. Still, the best product out there could be some simple coconut oil. It’s light, very easy to find, and you can even cook food with it.